these little bowtied bears are so cute! the fruit skewers are pretty too, and the pea pod leaves between the crinkle-cut carrots are a lovely, surprising choice. tamago nigiri is a great choice for bento because it's not as vulnerable to bacteria as raw fish. another stunning bento for your lucky kids!! I think this bento is definitly spectacular! You always inspire me with your little details, that make big differences in your lunches. 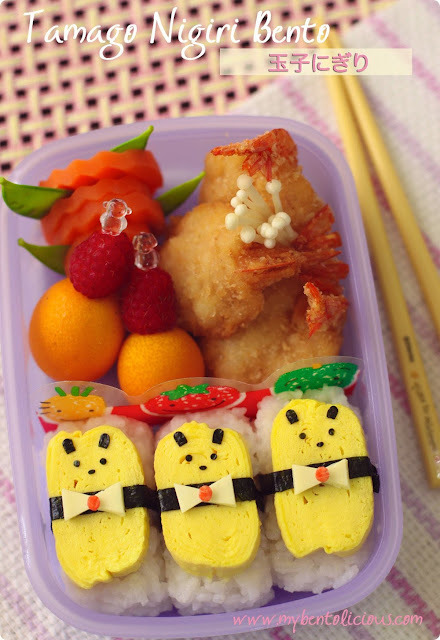 Your kids are really lucky to have someone who takes the time to make such lovely bento for them each day! @megan : Thanks a lot Megan for your very encouraging comment! I agree with you on the raw fish nigiri. Can't take that risk for the kids. I think you underestimate the awesome charm and artistry of your bentos! This one was full of the special details that make your bentos *shine*! The kumquats with cute picks, and delicate touches of enoki, little nigiri faces--all so sweet and lovely! Nothing special! I wish my everyday bentos looked even close to your nothing special ones :P It is adorable! I love the little teddies in suits! @Jenn : Thanks a lot Jenn for your kind words! The bento looks tidy and nice. Lia, do you have any post which shows or tells how to make tamago nigiri? Like everyone else, tamago is my boy's favorite as well. He considers it dessert, hehe! Your "blank" is very brilliant! What a shame, I thought tamago nigiri is the egg (@. @) hehehe, I actually want to ask how to make tamagoyaki (^o^).